Airport expansion is unsustainable – environmentally, socially, and politically. First and foremost, aviation is a hugely polluting industry, responsible for emissions of around 34 Mt CO2 e in 2013 in the UK. Airports also cause enormous suffering for local residents by drastically reducing local air quality and contributing considerably to local noise pollution. Imagine having a plane fly over your house at 80 decibels every 90 seconds. That’s something as loud as a pneumatic drill or a motorbike. Every 90 seconds! 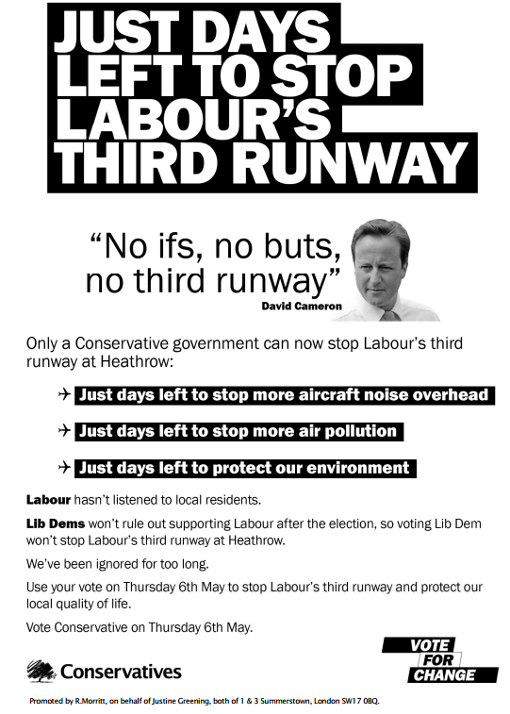 In 2010 David Cameron promised he would not back a third runway at Heathrow, “no ifs, no buts”. That’s the phrase Plane Stupid protesters picked up on Thursday 26th November when they blocked the tunnel leading to terminals 1, 2 and 3. It’s also a phrase that demonstrates as well as any other the government’s willingness to compromise their promises and U-turn on key commitments such as their commitment to tackling climate change. A non-committal response, or worse, no commitment at all, on climate change is exactly what is not needed in the run-up to the outcome of the Paris climate summit. The summit is considered to be a pivotal moment in the global struggle to limit the worst effects of climate change, and time is running out to reach a global agreement that will prevent warming of more than 2°C taking place, the agreed threshold considered to be “dangerous climate change”. Our dependence on carbon-based fossil fuels is driving climate change. Aviation is inherently carbon intensive because of its reliance on high-density petroleum-derived fuels like kerosene. You can’t safely substitute more than 10% of jet fuel for biofuels, and that’s before you even consider the associated issues of the food vs. fuel debate and whether biofuels may have even worse climate impacts. Aircraft themselves are also difficult to decarbonise – most of the efficiency savings that are currently technologically possible (such as weight reductions or streamlining aircraft bodies) have already been made and there are few remaining options. Marginal reductions of aviation’s carbon footprint are possible, for instance with the introduction of operational measures like air traffic management, but ultimately the only thing that will reduce emissions to a safe level is reducing the number of flights. In this context, it is clear that government plans to expand Heathrow airport are utterly unsustainable, and totally irresponsible. Direct actions like those taken by Plane Stupid activists last week and throughout 2015 are becoming more and more necessary given the failure of our government to listen to popular demands to scrap destructive plans like a third runway. On the 26th of November, just three days before the COP21 climate conference in Paris was due to start, three Plane Stupid activists blocked the main road access tunnel to Heathrow's terminals 1, 2 and 3. This reportedly caused a traffic tailback several miles long as police directed inbound vehicles to one lane of the outbound tunnel. Our early entry for the #ClimateGames - the direct action adventure game being used as a platform for actions around the COP21 - sent a clear message to the UK government that expanding aviation is a no-go for the climate. Were it to go ahead the UK would undoubtedly miss its emissions targets as set out under the 2008 Climate Change Act. Nor will aviation expansion benefit the majority of the population or businesses, as is often claimed. The demand for airport expansion is being driven by rich frequent flyers. Last year, less than half of people in Britain flew. Of those who did, a mere 15% of flyers took 70% of our flights. As well as noise and air pollution, poor people are paying the price in droughts, flooding and storms so that the rich can cook the planet with frequent leisure flights. Whilst we might hope that David Cameron might live up to his pre-election promise - “no ifs, no buts, no third runway” - we can't rely on it. After being forced to take non-violent disobedient action where all other options were exhausted, we stopped a third runway before and we'll stop it again this time too. At the COP21 talks this year in Paris, the theme for the mass day of action on December 12th (D12) is Red Lines. These red lines represent lines minimum limits for a just and liveable planet that must never be crossed if we are to stay within the 2C rise in global temperatures. Failure to stay within this threshold will take us down a road where even if we reduce emissions to zero, feedback loops will mean that emissions will continue to rise. The result: climate chaos. In reality there are many Red Lines we should not cross, but governments and corporations seem intent to do so. In the UK this includes the aviation industry, which if it continues to grow at its current rate will by 2050 emit all of the carbon it is safe for the UK to emit. Beyond this, other red lines that are being crossed nationally include increasing unconventional fossil fuel extraction through fracking, part of the government 'dash for gas' power stations rather than renewables. Internationally, there are similar concerns as well as a clear need to stop lignite coal mining in Germany and the Tar Sands in Alberta, Canada. Whilst there are many such examples of industries that cannot continue, overall the science dictates that the fossil fuel industry must transition to renewables and most of the carbon must be kept in the ground. Unlike the climate talks in Copenhagen, many activists are going to Paris with low expectations. We know that the heads of states and business leaders won't come up with a satisfactory deal to prevent climate catastrophe. Naomi Klein writes in 'This Changes Everything' that climate deals always come in second place to trade deals as corporate profit and perpetual economic growth are ideologically untouchable in our neoliberal era. 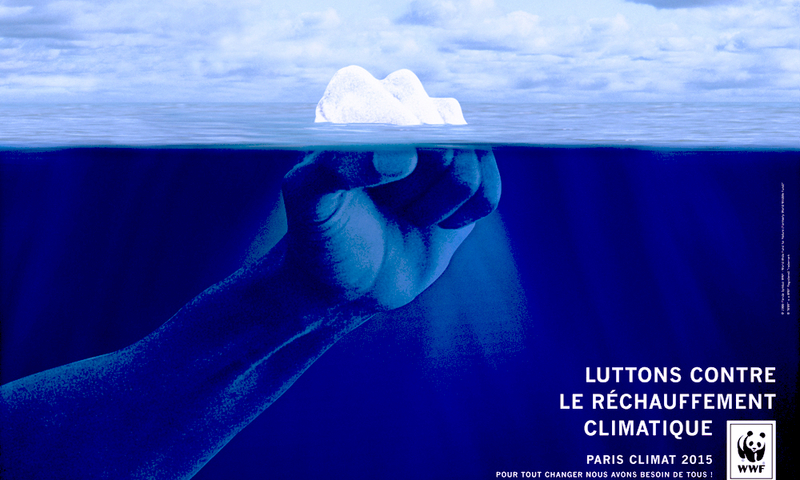 With this in mind, the aim for many activists is to see the Paris talks as a way for us all to network between struggles and to show on the twelth day, D12, that if our 'leaders' won't do it, then we can stop climate chaos ourselves. Unfortunately, with the recent events in Paris, marches have been banned out of fears over safety, but with creativity and determination we are finding ways to mobilise and still have the final word. However, given that we know that the solutions to the climate crisis won't come from the COP, let's see this as an opportunity rather than a problem. Let's get out and take action wherever the real #RedLines are: the dirty fossil fuel industries, the unsustainable, undemocratic mega-projects. #ClimateGames starts tomorrow. In this game we have nothing to lose but our fears. We have our whole futures to win. Asking our 'leaders' to solve our problems has left us with the hottest years on record, year after year. We are the solution we've been waiting for. The main road entrance to Heathrow airport has been blocked by climate change activists since 7.40 this morning. 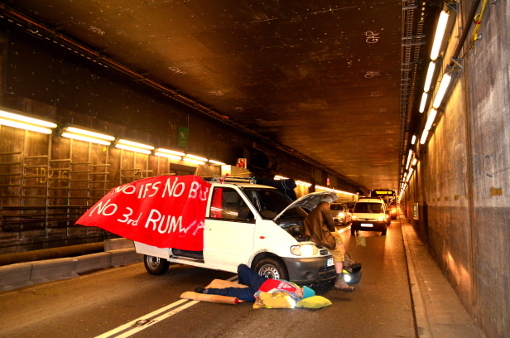 Three members of anti-airport expansion campaign group Plane Stupid parked a vehicle across both lanes of the entrance tunnel and locked their bodies to it, unfurling a banner quoting David Cameron's election promise: “No Ifs, No Buts: No Third Runway”. David Cameron has promised a decision by the end of the year on whether to build another runway at Heathrow. Plane Stupid spokesperson Cameron Kaye said, “Airport expansion would wreck the legally binding Climate Change Act, risking wiping out 55% of species this century and displacing 75 million more people from their homes by 2035. if aviation growth isn't reduced, by 2037 aviation alone could emit all of the carbon it's safe for the UK to emit. The government needs to choose: build new runways or stop climate chaos: it's that simple. On 13th July Plane Stupid blocked Heathrow's North runway, reportedly causing 22 flights to be cancelled and hundreds delayed. The 13 members of activist group Plane Stupid accused of “aggregated trespass” during a protest at Heathrow airport in July will have the full support of the Green Party when they face trial next year. The party’s autumn conference in Bournemouth passed a motion in support of the activists and deputy leader, Amelia Womack has outlined why the Party believes the protest to be just, stating that Heathrow Airport is a “major cause of illegal and deadly levels of air pollution” in the capital. “The stunt took place weeks after the Airports Commission recommended a new runway at Heathrow. The fact is Heathrow Airport is a major source of greenhouse gas emissions and the science confirms that greenhouse gases must be dramatically reduced from present levels to tackle climate change. “Moreover, Heathrow Airport is a major cause of illegal and deadly levels of air pollution in London. Local residents also suffer serious health impacts as a result of noise pollution and sleep disturbance. The action at Heathrow Airport prevented some planes from taking off and landing and took place at a critical moment, just after the Airports Commission reported. The Airports Commission failed to address climate change adequately in its report. Use of fossil fuels is destablising the climate and the life support systems upon which life depends, so we need to rapidly transition to a fossil free future. This means that we cannot have more carbon-intense mega-infrastructure projects like a new runway, in fact we need to reduce fossil fuel use dramatically from where we are now. It's up to people acting collectively to bring about a sustainable, just and fossil free world, since the government is taking us in the opposite direction. 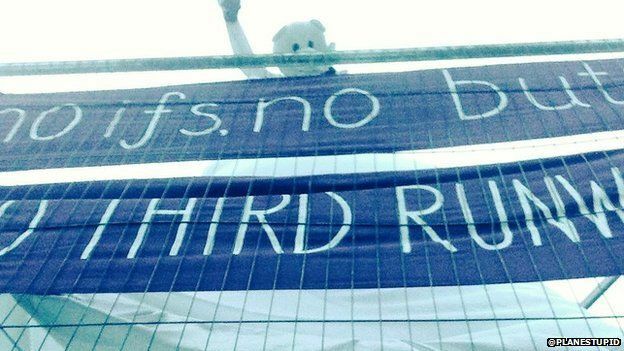 The 'Heathrow 13' activists also have strong support amongst the long suffering community around Heathrow. The trial takes place at Willesden Magistrates' Court starting on Monday 18 January 2016. Plane Stupid would like to thank all of the signatories to the letter below, sent to the Crown Prosecution Service on Friday 9th of October, 2015. We are deeply grateful and appreciative of all the support we have received - from the signatories, from Heathrow’s local residents and from other groups campaigning for David Cameron to keep his promise. No ifs, no buts, no new runways, anywhere. In July a group of climate activists with anti airport expansion group Plane Stupid took peaceful direct action at Heathrow Airport. They have been charged with aggravated trespass and being in a restricted area of the airport without permission. The Plane Stupid action, which came just weeks after the recommendation by the Airports Commission to build a new runway at Heathrow, highlighted the importance of considering climate change in the context of any discussion about the future of the aviation industry. The science tells us that deep cuts are required from existing levels of greenhouse gas emissions to tackle climate change, but successive governments, including the present one, have failed to act appropriately. A new runway, and the many thousands of extra flights it would allow, would make the necessary cuts far more difficult to achieve. Against this background, with the failure of the democratic process, the actions of the Plane Stupid activists were reasonable, justifiable and honorable. We, the undersigned, call upon the CPS to drop the charges against the activists in the public interest – we should be congratulating them for the defending the planet, not prosecuting them. Yesterday, we - the 13 Plane Stupid activists who occupied the northern runway of Heathrow Airport for over six hours on 13th July - had our hearing at Uxbridge Magistrates Court. All 13 of us pleaded not guilty to both charges brought against each of us, and are now set to have a full two week trial, commencing on Monday 18th January 2016. We arrived at court in the morning to be greeted by a whole array of media journalists, as well as a sea of supporters, including local residents and campaigners from grassroots groups and NGO’s, elected representatives of political parties, and even a handful of polar bears! We would all like to sincerely thank all those who were able to come to the court to support us, as well as those who have shown their support from afar. It’s touching to feel so supported by so many people, for taking the action that we have. Thank you all; your invaluable support means so much. Needless to say, starting the day with polar bears, friends and supporters fuelled us with hope and joy for the day to come. We were always aware that this hearing was going to be relatively simple; mainly an opportunity for us defendants to receive the prosecution’s case against us (although this didn’t actually materialize in the end) and for each of us to enter our pleas. And our amazing lawyers from Bindman’s and Hodge, Jones & Allen walked us though the process and made sure we were supported thought the day. Last time this runway was defeated, climate change was at the core of the argument. Local campaigns such as HACAN, Stop Heathrow Expansion and NOTAG have been fighting aviation expansion for years and, whilst winning some concessions, Heathrow continues to lie to the public, and the Government continues to ignore climate change. But climate change won’t wait for an unwilling political system to act. Any kind of airport expansion in the UK will make it impossible for the UK to meet its legally binding target of reducing CO2 emissions by 80% (from 1990 levels) by 2050. It’s really that simple. In fact, the aviation industry is the only carbon intensive industry in the UK that is effectively being given a license to pollute. Furthermore, the ‘need’ for airport expansion is being driven by the wealthy minority (10-15%) of UK citizens who are responsible for booking the vast majority (70%) of flights in the UK, mainly to short-haul destinations that could easily be reached by train. Heathrow continues to lie about the economic benefits, and underplays the real cost to the public and climate that airpot expansion will have. It’s reassuring to know that the amount of time the court has given us will allow us to adequately put forward our case, and that the overwhelming support from both inside the court room, outside the court and in the general media, shows that people agree with us and feel it’s important for the issues to be heard. Social and regular media this week has been awash with our message that climate change must be at the forefront of the debate around airport expansion and if it takes its rightful place as the key issue, it rules out expansion. #Heathrow13 shows just a pocket of this support from all over the country; this is not just a local issue even though some of the activists involved are local residents. I am filled with a lot of hope for the future; the support we have been shown is truly heart warming, from letters from parents to local residents and fellow activists. 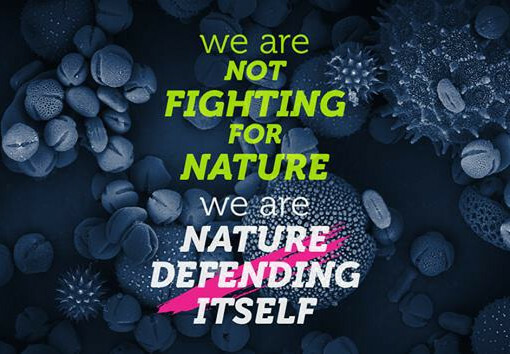 The only way for this campaign is up, but we can’t fight climate change alone. The Government needs to be shown our true power, so please continue to support Plane Stupid, HACAN, Stop Heathrow Expansion, Grow Heathrow, Gatwick Obviously Not!, Reclaim The Power, and all the other groups and organisations fighting airport expansion. Together we can stop this! We’ve done it before and we’ll do it again. No If’s, No Buts, No Third Runway… and we mean it!